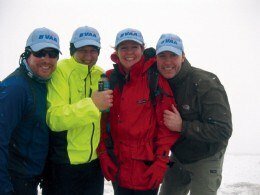 The BVAA Hat continues its travels, this time in some truly ‘mad’ conditions! Pictured (shivering) are Rhys Jones, Simon James, Sian Elvis and Nathan Adams of Hobbs Valve on the ‘Thunderwalk’ – a 24 hour, 54 mile Charity walk in the Brecon Beacons. Team ‘Rhys Lightening’ donned BVAA hats for the occasion. Hobbs Valve and the BVAA were delighted to make a donation to the team’s JustGiving site in aid of Noah’s Ark Appeal, a Children’s hospital in Wales. For the record, so far the team have raised over £3000. They completed the course in 20 hours, finishing 4th out of 52 teams competing. Well done guys.